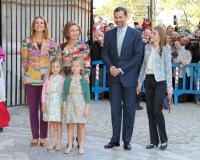 (L) Princess Leonore, Prince Felipe, Princess Sofia, Princess Letizia arrive at the Club Nautico of Palma i the evening. 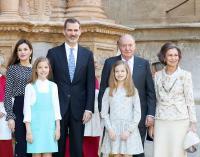 Crown Prince Felipe of Spain attends at the sail boat Hispano the 30th edition of the Copa del Rey Audi Mapfre, it starts at the El Real Club N‡utico de Palma. 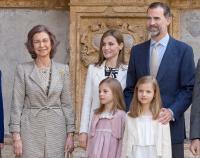 Spanish Crown Princess Letizia and her two daughters Princess Leonore and Princess Sofia picked up Crown Prince Felipe up on the second Day of the 29th edition of the King's Cup ( Copa del Rey) sailing race in the yatch club of Mallorca Island. 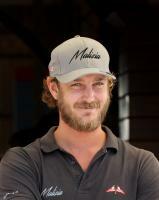 Start of the 29th edition of the King's Cup ( Copa del Rey) sailing race in the yatch club of Mallorca Island. 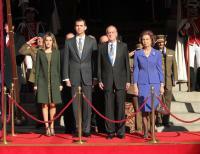 MADRID, En La Plaza de Lima, Spanish Royal Family attends celebrations of the national day. Start of the 29th edition of the King's Cup ( Copa del Rey) sailing race in the yatch club of Mallorca island. The regatta Copa del Rey Audi Mapfre. A total amount of 110 boats, from 19 countries, will strive to win the most important regatta of the Mediterranean.